Been a long while since I did a post… but here’s a little update with something I have extensively worked on at The Moving Picture Company in London: World War Z.
I was involved early on as a senior member of the MPC Crowd Team led by Marco Carboni that brought the zombie crowd shots of the Israel sequence to life. We started of doing a lot of crowd motion/look development and had to considerably push our proprietary ALICE crowd technology to achieve the more complex crowd shots that had dense masses of zombies swarming, climbing walls, crawling over eachother and physically interacting with eachother. It has been an exiting (sometimes exhausting;) ride prototyping and implementing new behaviours, systems and ragdoll simulations to achieve some interesting crowd work seen on the big screen 🙂 ! Over the last few months as a side project I have been playing around with a social media networks minded side project: iBark! Together with my friend @jelledeweerdt we created an android app that unifies your Facebook – Twitter – LinkedIn and lets you Share, Get and Send comments, All In One Place! If you own an android device and this sounds like a tool for you make sure to head to the Google Play Store and give it a go! Any feedback would be very very welcome… feel free to comment here or drop a mail to team@ibark.it. Quick shout to announce that a movie I worked on in Sydney over the past one and a half years has made its way into the theaters! Just finished my Master Course in Bournemouth which wrapped up the end of August. It was a highly intense but super interesting year where I got to know some talented cg folks which I won’t forget quickly. Time for a quick trip home and a short break after which a new episode will start working at Framestore london. And Lars Van Der Bijl’s demolition of The Tower Of Pisa project on which I helped out with the crowd sim and assisted on set. Lately I was looking at rigging feathers on a wing in XSI and I decided to develop a small prototype tool for dealing with this. Basically it started out as a procedural feather system which enables you to draw out a curve and attach it to your bone system (or extract from a mesh) and generate a desired amount of feathers onto that curve. For the generation you can provide your own feather you model up. On generation you can adjust a set of parameters the script will take into account as for example add in some randomness in scale variation or some offsets. 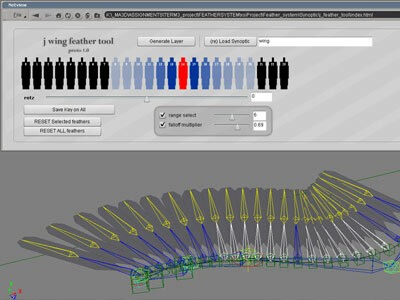 After generation you have a set of custom controls to adjust your feathers as well as a flash interface that pops up to manage your feather distribution and individual placement. The idea is that you animate your bone chain and afterwards you can go in and adjust the exact feather placement and bake that in as animation too. This gives you a lot of control in tweaking your feathers. The system is still a prototype having some pros and cons and probably still some bugs in there but it definitely was a very good exercise in scripting for rigging and putting the flash-xsi bridge I developed (more info soon) to a more advanced use. I will keep developing this as I think it might be useful for people who quickly want a wing feather setup for their character. Feel free to leave any comments or ideas or drop me a line if you fancy to give it a try. I will upload the tool at a later stage.